BigRep's NERA is the world’s first fully (FFF) 3D printed, functional e-Motorcycle. 3D printing thought and innovation leader BigRep today showcases NERA, the world's first fully (FFF) 3D printed, functional E-Motorcycle. Opening a new dimension for Additive Manufacturing, the prototype designed by NOWLAB, BigRep's innovation consultancy, and printed on BigRep's large-scale 3D printers (BigRep ONE). 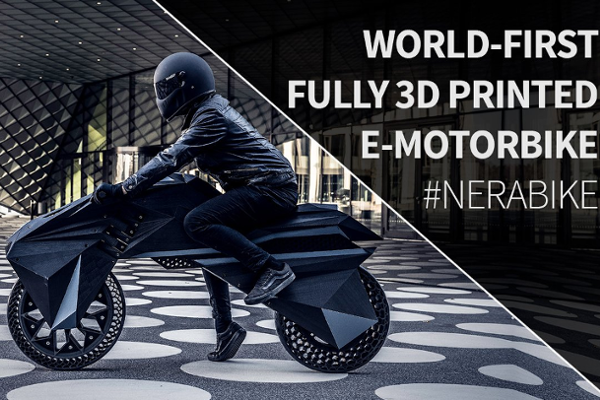 The NERA E-Motorcycle is the world's first fully 3D printed e-motorcycle with groundbreaking features like airless tires, embedded electronics, and forkless steering. Using 3D printing technology for cutting-edge e-mobility solutions, NOWLAB has developed the world's first fully (FFF) 3D-printed and functional e-motorcycle, the NERA. All NERA parts, excluding electrical components, have been 3D-printed, including tires, rims, frame, fork and seat. In building NERA, the engineers didn't simply adapt existing motorcycle designs, but instead envisioned a bike for large-format FFF technology, setting a benchmark for truly creative design; breaking the limits of traditional mechanical engineering. Among the many innovations featured in NERA are the airless tires with customized tread; a lightweight rhomboid wheel rim, flexible bumpers (instead of suspension) and the electric engine, which is fitted in a customizable case. NERA illustrates the massive benefits that 3D printing offers for the production of end-use parts, particularly for batch sizes between lot size one to small series by reducing lead times and costs, optimizing supply chains, and limiting dependency on supplier networks.